A lovely Thursday morning and it seems as if the day was going to run smoothly. Boy, isn't that wonderful. Slowly, and little by little we started catching a handful of green crabs. Kids would come to look around and then go inside the museum. "I think I caught something!" 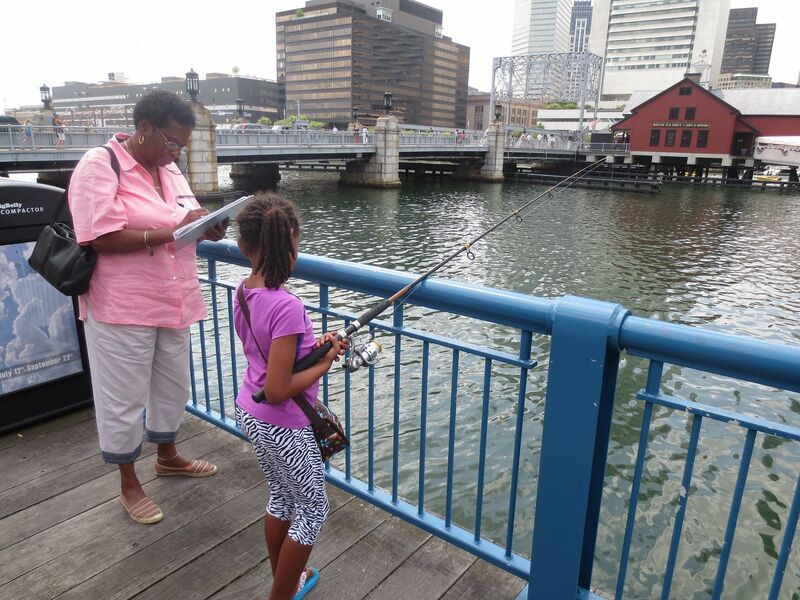 the little girl exclaims to what it seems to be out of nowhere as we help her pull up the fishing rod. She actually did catch a fish! Everybody was so surprised she accomplished something that we have been trying to do all summer in just a matter of minutes. Quickly, we put the fish in the touch tank with the other crabs and two other small fish that got caught in the crab trap. The fish that the child caught was bigger compared to those that were accidently caught by us in the trap. Seconds after taking pictures of the most exciting thing that happened during that Thursday morning the parents took her back inside giving her props for catching her first fish and doing something cool before even entering the museum. I thought my day was going to go exactly like that until one by one and two by two kids started coming in packs. I was shocked to notice how many kids can actually crowd a small plastic box (the touch tank) in only a few minutes. I quickly demonstrated to them how to use the net as to not hurt any of the animals. It was nice to see the kids taking a small leadership roles and taking turns as well as enjoying the marine life.